If you are looking for a superior copier at an unbeatable price, then Arizona Copiers has just what you need: we recommend the Konica Minolta Bizhub C654, a high quality do-it-all copier that will enhance your productivity exponentially. Whether you need secure faxes and scans, perfect copies, or high resolution printouts, the Konica Minolta C654 can do it. The Konica Minolta C654 INFO-palette design allows you to securely access a broader scope of information by communicating more effectively. Using a Konica Minolta allows you to safely share and reproduce images and documents at lightning speed. With access to your copier has never been easier. The Marketplace provides you with a myriad of internal apps and computer software applications that allow you to securely communicate with your copier, whether in or out of the office. These features include wireless printing from your mobile phone or computer, instant email uploads, stock quotes, and a growing number of other functions; the Konica Minolta C654 has an independent app market that sets its functionality limits at the edge of your imagination! The Konica Minolta Bizhub C654 is an amazing copier, and that is why we offer a number of great pricing options and leasing options to make sure that you can have the copier with the ownership style that suits you best. At Arizona Copiers, we give our customers the flexibility to choose whether they want to buy or lease a copier from us, because we know that all of our customers are different and have unique needs; giving you these choices allows us to better tailor your order to match your individual requirements. Are you in need of a Konica Minolta Bizhub C654, but you do not want to invest a large chunk of your cash in other business assets or operations? 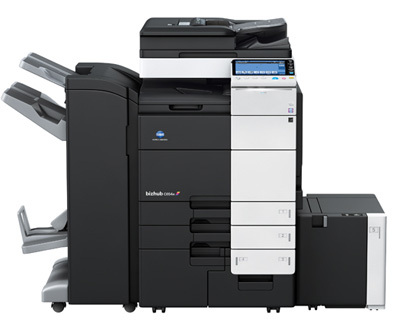 Choosing to lease on Konica MInolta Bizhub C654 is the perfect solution. Deciding to lease a copier provides you with ownership without the upfront costs, and future purchasing flexibility—once your lease term is completed, we give you the freedom to upgrade to a newer model. This ensures that you are never out of the loop when it comes to having the latest and greatest copier at your command. We offer flexible lease plans that allow you to possess your Konica Minolta C654 for a long enough term to get optimal use out of it. Owning a Konica Minolta C654 outright means that you never have to worry about making monthly payments, and that you can get as much use out of the copier as you need—from the time of purchase until the end of time. At Arizona Copiers, we offer the Konica Minolta Bizhub C654 at the best possible price so that you can maximize the value of your purchase when you choose to own the copier.